Contains a single species Hedobia imperialis L., a very local species across southern England and the midlands. In the wild a wood boring beetle of Rosacea (Rosa, Crataegus), found by beating old hedges. Also recorded emerging from old furniture (Hickin). 3.5-5.5mm. Antennae filiform, terminal segments not longer than the rest. 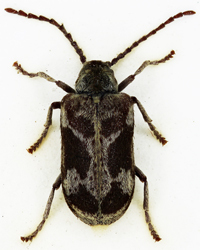 Pattern of elytral pubescence gives the beetle a distinctive appearance. Spider beetles. 9 genera. 23 spp. Native species as well as established introductions from Europe and America (e.g. Mezium affine Boiedieu, Sphaericus gibboides (Boiedieu)) and species only occasionally introduced with foodstuffs (e.g. Stethomezium squamosum Hinton, Pseudeurostus hilleri (Reitter)). Smooth and shiny beetles with yellow pubescence on antennae and legs. Head retractable into, and hidden by, thorax. Antennae simply filiform, usually 11 segmented and inserted on frons, distance between insertions less than length of joint 1. Thorax usually narrower than elytra and constricted towards base. Elytra completely covering abdomen, generally rounded or globular but sometimes elongate e.g. 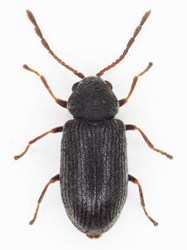 Ptinus sexpunctatus, Panz. Legs well developed and long, tibial spurs obsolete, tarsi 5-5-5 with first segment as long as second. Many are found among stored seeds and vegetable matter, several are granary pests. Ptinus fur L., the white marked spider beetle, is often found indoors, it is destructive to dried stored products as well as furs and even books. Several are associated with old timber both inside and outside e.g. Niptus hololeucus Fm., the golden spider beetle. 2 genera. 3 spp. 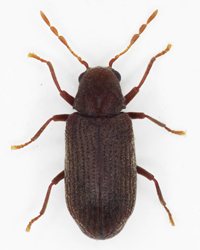 The three species of Grynobius keyed in Joy are now considered to be a single species, G.planus (Fab.) 4-5.5mm. with last 3 antennal segments longer (about X3 length of 8) and more robust than the others. 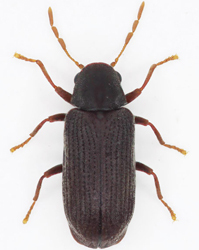 Distinctive in having elongate dark red or black elytra with 7 or 8 raised pubescent ridges. Locally scarce in dead hedges and decaying broad-leaved timber. In both Dryophilus spp. the last 3 antennal segments are very much longer than the rest. D.pusillus (Gyll.) is locally common and associated with conifer wood. 3 genera. 8 spp. Of the general shape of Ochina. Xestobium rufovillosum (DG.) 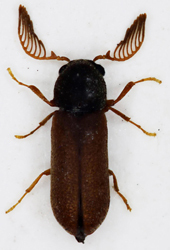 is the notorius Death Watch beetle, a locally common species throughout southern England, rare in the north and with a few records from southern Scotland. Larvae live in hardwood where fungal decay is present, often in structural timbers. Black to reddish with patches of yellow pubescence. Recognised by the prescence of two longitudinal ridges on each elytron from base to about middle, the innermost extending further. Last three antennal segments distinctly wider forming an elongate club. 5 genera. & spp. 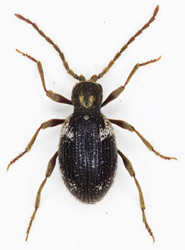 Including Anobium (=Hemicoelus) nitidus (Fab.) added to the British list in 1982. 2-5.5mm. Antennae filiform with the last three segments longer and broader than the rest, inserted further apart than the length of joint 1. Elongate beetles with shield shaped pronotum and deflexed head. Elytra elongate, striate and pubescent. Species are either wood borers or pests of various stored products. 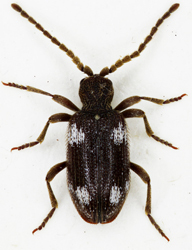 Includes Stegobium paniceum L. a pest of dried foodstuffs, the common Anobium punctatum (DG.) a notorious furniture beetle and Hadrobregmus denticollis (Cr.) a wood borer found in a range of broad leaved trees. 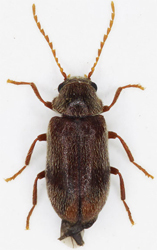 Includes a single species Ptilinus pecticornis (L.). 2 genera. 2 species. Xyletinus longitarsis Jans. is a rare woodborer found throughout southern England and the midlands. 2.5-4mm. black with three basal antennal segments and legs orange. Antennae serrate. Thorax broadest at base and elytra with well marked striae. Lasioderma serricorne (Fab.). The Cigarette beetle. Widely distributed and local, found in a variety of dried vegetable products but more especially, and not surprisingly, tobacco, also in wood already infested with wood boring larvae. 2.5-3.5mm. Much less elongate than most members of the family, shining red and finely punctate throughout with very short pubescence. Elytra with a row of larger punctures near suture, otherwise without striae. Fourth antennal segment much wider than others, assymetric; expanded on inner side. 3 genera. 8 spp. Dorcomata spp. and Anatys rubens Hoff. are wood borers, Caenocara spp. are fungivores. All are rare species of southern England or the midlands. 2-3mm. Atypical Anobiids; short, round or oval with characteristic antennae, 8-10 segmented with large basal segment and three terminal segments expanded, sometimes greatly so, generally on the inner edge. With deep cavity between front coxae for antennal reception. 1st ventrite excavate to receive hind legs. Members of the Heteromeran Aderidae are superficially very similar and likely to be mistaken for the present family. Members of the Throscidae have an assymetric three segmented club and with their general habitus might be taken for Anobiidae. At least 16 species have been added to the british list since Joy and so the Coleopterist check list must be consulted and Hodge and Jones used for references. The groups are dealt with by Lohse in Freude,H. Die Kafer Mitteleuropas, Vol 8. Hickin should be consulted for the biology and ecology, a fairly comprehensive work dealing with many species detail.